This diamond and South Sea Pearl brooch features a symmetrical geometric yellow gold design set with uncommonly large custom cut baguette diamonds for a total weight of 5.60 carats. The bow suspends a voluminous South Sea pearl of 17.5 x 16.5mm dimensions, held by a top set with 0.20 carats of round diamonds. All of our diamonds are of top quality (color, clarity, and cut). 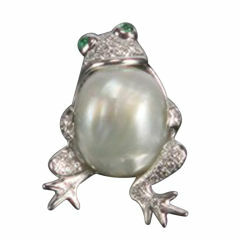 All of our pearls are untreated: their natural color and luster have not been enhanced in any way. 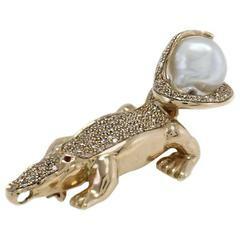 The brooch is one-of-a-kind. It was handmade in Italy in our own workshop by maestro Scalabrì according to an original design by Ella Gafter. The item is signed Ellagem.